A couple stores around here sell a chicken salad kit by Okami with all you need for a delicious meal in one box, minus the lettuce. 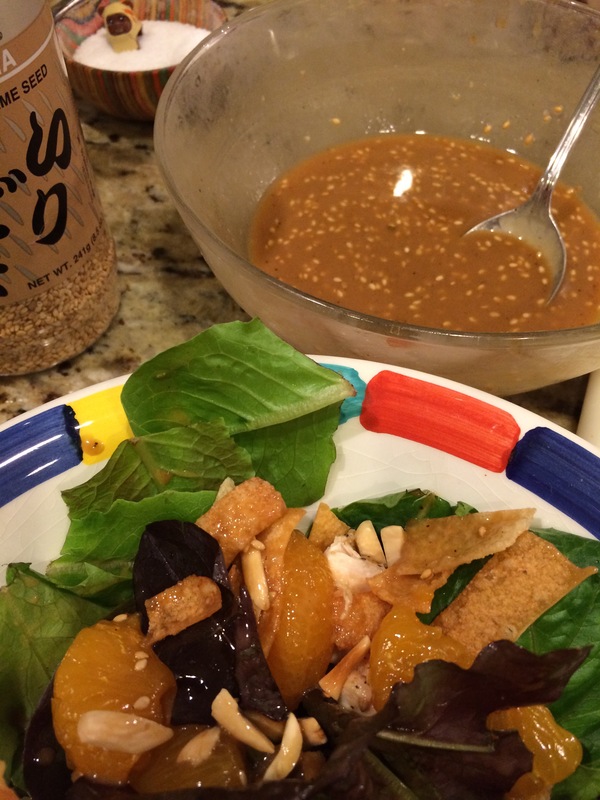 The sliced almonds, two kinds of crispy noodles, cooked chicken strips, (there used to be orange segments, too), and the best part- a really good salad dressing with Asian flavors. One store sells a double package that we can never finish (Costco) and the other store is out of my way. The only solution: make my own. I figured I could do a better job on the chicken, too, and reduce some of the unnecessary junk found in the dressing, too. Lucky me, The Food Network came through with a dressing that after a few tweaks, was really close to the Okami kit. 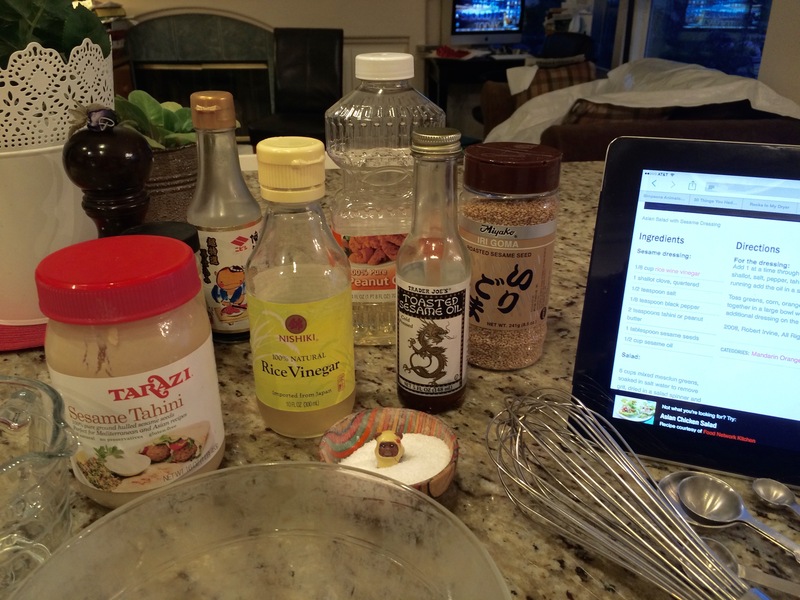 The special ingredient is tahini- the sesame paste you put in your hummus. The original recipe that inspired some of the ingredients and amount can be found here, on FoodNetwork.com, my changes included the soy sauce and honey, and using a combination of toasted sesame oil and peanut oil- all sesame would be quite overpowering, if it is a toasted oil. Whisk all ingredients together, that’s it! Drizzle about two tablespoons over 3 cups of salad greens. Suggested salad should include chopped chicken, Mandarin orange segments, toasted sliced almonds, and fried chow mein noodles or won ton strips. And yes, the chicken was a lot better than the salad kit. I just took boneless breasts, sprinkled them with onion and garlic powders, salt and pepper, and grilled them for about four minutes per side. May take three minutes per side, don’t overcook. KEY STEP: let the chicken rest for 15 minutes, and you will end up with the juiciest and most tender boneless white meat you’ve ever cooked. Go make this, save money, get more real foods into your happy mouth and enjoy this soon. Thanks for the recipe! I thought this would be great for dinner tonight, but, but I don’t have Costco nearby. When I do buy it I freeze the extra portion of chicken and put everything else in the fridge and have it a week later or so. Like to add extra veggies to it, green onions, shredded carrots, and zucchini, cucumbers, whatever I have on hand. Oh, I like your idea of adding all the extra vegetables! I like this dressing since the Costco package is always too much food for us, and the dressing is the best thing about it, ha. So… if I use my own salad, your veggie idea, and this dressing recipe, I just need to have some crunchy noodles or crispy wonton wrappers, canned mandarin oranges and sliced almonds in my cupboard and I’ll have a really nice salad, no trip to Costco necessary!